Creative Relaxation is found at "Canvas and Corks"
While the hustle and bustle of everyday life can become a burden, The Otesaga Resort Hotel helps sweep away any stress with a simple stroke of a brush. 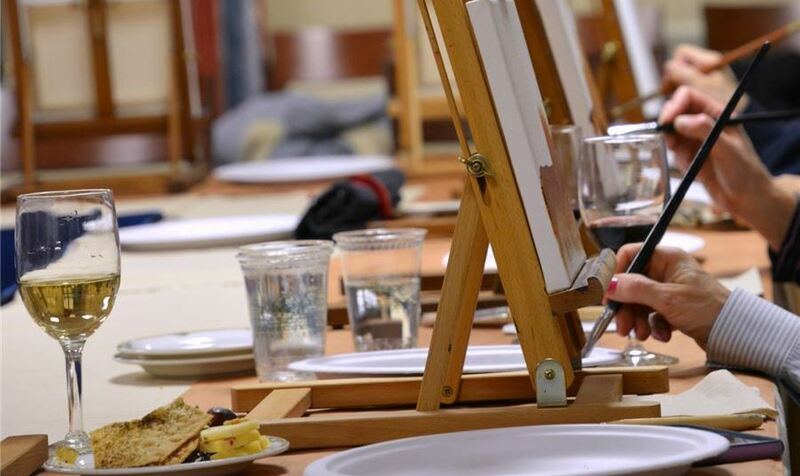 “Canvas and Corks” is a fun night out for friends, couples and individuals to unwind and learn a variety of painting techniques while savoring local cheeses and seasonal fruits, and wine! Not only is painting an enjoyable way to spend time with those closest to you, it’s great for your health too. Studies have shown that painting fosters creative growth, strengthens memory, offers stress relief, and builds problem-solving and motor skills, just to name a few. Each painting class is taught by renowned artist, Susan Jones Kenyon, a self-taught, impressionist painter from Cooperstown, New York. She began to paint professionally in 1996, focusing on portraiture and realism. The following year, she expanded her repertoire to include folk art style painting on furniture, ceiling and wall murals, and trompe l'oeil. Her stunning works have been displayed in the Fenimore Art Museum and her paintings and other works have sold nationally and internationally to corporate and personal clients in New York City, Boston, San Francisco, Carmel, Madrid (Spain), and throughout upstate New York. Susan’s classes, that take place from 6 - 9 p.m., are perfect from beginners and experienced painters, alike. You'll brush and sip your way to a completed individual masterpiece by evening's end. For only $75 per person, per class, you’ll receive a variety of local cheeses and seasonal fruits, wine & materials. To see a list of upcoming Canvas and Corks classes, visit our events page and be sure to call 607-544-2524 for reservations (required).